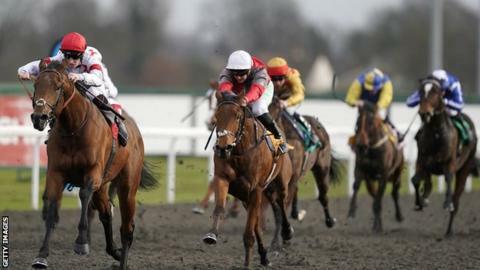 All British horse racing on Thursday has been cancelled because of an outbreak of equine flu. The BHA has said horses from infected yards have raced today at the Ayr and Ludlow race courses. The BHA said that the fact that the cases have been identified in vaccinated horses was "a cause for significant concern over welfare and the potential spread of the disease and the action to cancel racing has been viewed as necessary in order to restrict, as far as possible, the risk of further spread of the disease". In 2001, an outbreak of foot-and-mouth disease wiped out racing for two months in Britain, leading to the cancellation of the Cheltenham Festival, which is held every March. Symptoms include fever, coughing and nasal discharge. "The BHA's veterinary team has today been in contact with more than 50 trainers and veterinarians to allow it to make an informed assessment of the risk of equine influenza spreading". A number of stables, including those of Nicky Henderson and Paul Nicholls, were placed on lockdown while further testing was undertaken on horses who might have come into contact with the McCain runners earlier in the week. The BHA is working closely with the Animal Health Trust and will issue a further update tomorrow. "When new horses arrive at our yard we, as much as possible, try to keep them separate but at this stage can not know if the infection came from recent arrivals or from horses returning from racing".